“We have three solutions to Daisy,” announced Boy Child gleefully as I walked in the door with Girl Child. I have a 16-year-old daughter who has a huge, irritable diva of a mare with whom we had just been arguing. The mare wants to be lame. We don’t want the mare to be lame. The mare wants to kick people, places, things. We don’t want the mare to kick people, places, things. We were not in a peace, love, joy, frame of mind. Girl Child evacuated to her room. I stood, glowering in the kitchen. There was no such escape for me. “First,” he continued believing that I really wanted to hear this. “We can just make her your writing office and she won’t go anywhere.” Well, he had half of it right. But I bought a camper and not a playhouse. “Or your second choice is that we can do a structural rebuild for really close trips and you can go like 20 miles an hour in her.” That should make a lot of friends on I-24 headed to Bonnaroo happy. I squinted in my I’m-grumpy-what-the-hell-are-you-trying-to-tell-me way. He was getting nervous. His dad left to fold laundry. The man will sacrifice his own child. And that’s the good news? What the HELL? Admittedly, I knew that Boy Child had seen the same disturbing photographs online that I had seen. A woman bought a refurbished vintage camper and was driving it across country, to her home. Somewhere along the way, the camper started snaking and then basically pulled off of its chassis, causing the whole thing to roll over a couple of times. And, yeah, it made the Range Rover that was pulling it roll over a couple of times also. My take was that Range Rovers are renowned for their rollover issues. Get a better tow vehicle. The boys didn’t go for that. When they discovered Daisy’s rotten wood barely supporting her roof, they started digging around under her floor. You just can’t get 56 years out of wood that has been water damaged for decades any more. “She’s just old,” declared Spousal Unit. I glared at him and reminded him that he and Daisy were born the same year. Didn’t he have towels to fold? His colleague would elbow back and grin. “We have three options. Let him suffer. Let him die. Let him suffer and die.” Mrs. Soandso would turn, stunned, toward her husband and they would wonder which was the good news? My menfolk stood on either end of the kitchen, me in the middle. I was 600 British, rushing into the valley, not knowing that I was surrounded on three sides by Russians with full artillery. My saber was useless against their numbers and their weapons. It was my Charge of the Light Brigade, mine to do and die. Don’t ask me. I don’t know what I meant by that, either. 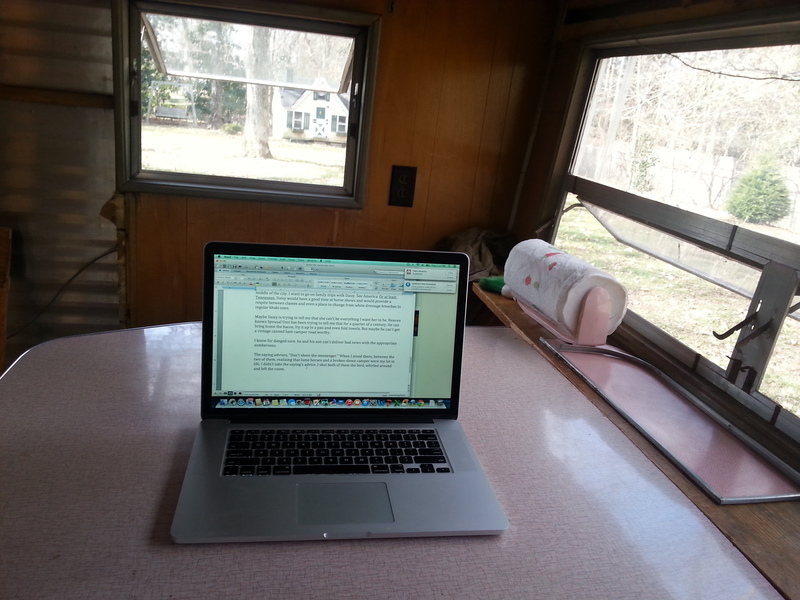 Five days later, I am sitting in Daisy, actually writing from within her broken shell. This is still sacred space. but I don’t know how or for what this space will be used. I want Daisy to be able to do it all. I want her to be a writing retreat in our back yard, or snuggled up to a creek, or in the middle of the city. I want to go on family trips with Daisy. See America. Or at least Tennessee. Daisy would have a good time at horse shows and would provide a respite between classes and even a place to change from white dressage breeches to regular khaki ones. Maybe Daisy is trying to tell me that she can’t be everything I want her to be. Heaven knows Spousal Unit has been trying to tell me that for a quarter of a century. He can bring home the bacon, fry it up in a pan and even fold towels. But maybe he can’t get a vintage canned ham camper road worthy. I know for danged sure, he and his son can’t deliver bad news with the appropriate somberness. The saying advises, “Don’t shoot the messenger.” When I stood there, between the two of them, realizing that lame horses and a broken-down camper were my lot in life, I didn’t take the saying’s advice. I shot both of them the bird, whirled around and left the room. I know what to do…..buy a flat bed trailer and pull daisy up on that. You can tow her everywhere without her wheels touching the ground. They haul cars, why not daisy. Love ya lil sis. You could have Daisy as a backyard camper for writing at home, and a second, more travel-worthy one for your trips. Like a Tear-drop camper–have you seen those? They are cool.